For adults (18 and older) and parents on behalf of their minor children. YOU MUST CHECK "I AGREE" TO ALL SECTIONS OR WAIVER CANNOT BE SUBMITTEDAND YOU CANNOT PARTICIPATE IN ACTIVITIES, OR USE THE GYM'S FACILITIES OR EQUIPMENT. CLIMBING, YOGA, TEAM-BUILDING, CAMP, EXERCISE, DANCE, BOOT CAMP, ZIPLINE, SLACKLINE, RAPELLING AND OTHER ACTIVITIES AND USE OF THE GYM’S SERVICES, EQUIPMENT AND FACILITIES AT THIS LOCATION, ALL OTHER LOCATIONS AND ANY OFF-SITE LOCATIONS ENTAILS SIGNIFICANT RISKS, BOTH KNOWN AND UNKNOWN, WHICH COULD RESULT IN PHYSICAL OR EMOTIONAL INJURY, PARALYSIS, DEATH, OR DAMAGE TO US, TO PROPERTY AND/OR TO THIRD-PARTIES. SUCH RISKS INCLUDE, AMONG OTHERS, (a) FALLS FROM THE CLIMBING SURFACE ONTO THE FLOOR, ROCK SURFACE, PROJECTIONS, PADS OR OTHER OBJECTS, (b) FALLING ONTO OTHERS PRESENT, (c) CLIMBERS OR OTHER OBJECTS (SUCH AS ROPES, HOLDS OR HARDWARE) FALLING ONTO US, (d) IMPROPER USE, INSTALLATION OR MAINTENANCE OF GEAR, EQUIPMENT AND/OR APPARATUSES, (e) GEAR AND EQUIPMENT DEFECTS OR MALFUNCTION, (f) FAILURE TO FOLLOW PROPER CLIMBING AND/OR BELAY PROCEDURES, (g) IMPROPER OR INSUFFICIENT TRAINING, SUPERVISION AND/OR INSTRUCTION, (h) ROPE ABRASION AND/OR ENTANGLEMENT, (i) CUTS AND ABRASIONS RESULTING FROM SKIN CONTACT WITH THE CLIMBING WALL, (j) FAILURE OF ROPES, SLINGS, BOLTS, CHAINS, CLIMBING HARDWARE, ANCHOR POINTS, OR ANY PART OF THE CLIMBING WALL STRUCTURE; (k)TWISTED OR BROKEN ANKLES, FEET AND OTHER BODY PARTS, MUSCLE, LIGAMENT AND/OR TENDON TEARS OR STRAINS, JOINT AND/OR SPINAL INJURY, SPRAINED NECK, ROTATOR CUFF INJURIES, HEAD INJURIES, STRAINING MUSCLES FROM OVER-STRETCHING, CONTACT WITH ANOTHER PARTICIPANT AND DIZZINESS, and (l) NEGLIGENCE OF BELAYERS, OTHER PARTICIPANTS, THIRD-PARTIES AND/OR THE GYM. CLIMBING IS AN EXTREMELY HAZARDOUS AND DANGEROUS ACTIVITY AND INVOLVES BOTH INHERENT AND EXTRINSIC, AND BOTH NATURAL AND ARTIFICIAL RISKS. These are not all of the risks associated with our participation in the activities, and the above list in no way limits the scope of this Agreement. We also realize that climbing indoors is not the same as climbing outside, and that climbing outside requires additional training. Our participation is entirely voluntary and with a full understanding that all such usage involves all manner of hazards and dangers. We choose to participate in spite of the risks. WE ACCEPT AND ASSUME ALL RISKS, BOTH KNOWN AND UNKNOWN, WHETHER CAUSED OR ALLEGED TO BE CAUSED BY THE NEGLIGENCE OR GROSS NEGLIGENCE OR OMISSIONS OF THE GYM. We have a responsibility to ourselves and other users of the GYM, to conduct ourselves in a safe manner. As directed by the GYM, we will watch the Gym’s basic climbing instruction video, participate in an orientation and/or receive basic instruction before climbing or belaying. If we are unsure about how to safely engage in any activities at any time, we will ask GYM staff for further instruction BEFORE participating. We are in good health and have no condition that will affect our safe participation in the activities, or else we assume and agree to bear the costs of all risks that may be created, directly or indirectly, by such condition. We will not use the GYM while under the influence of drugs or alcohol or while in any other condition that might impair us. We have adequate insurance to cover any injury or damage we may cause or suffer while participating in the activities, or else we agree to bear the costs of such injury or damage. We use and accept items received from the GYM "AS IS" with no warranty, and participate in the activities and use the facilities and equipment at OUR OWN RISK. The GYM has no responsibility for lost, damaged or stolen items. WE HEREBY VOLUNTARILY AND KNOWINGLY FOREVER WAIVE, RELEASE, AND DISCHARGE AND AGREE TO DEFEND, INDEMNIFY AND HOLD HARMLESS THE GYM FROM ANY AND ALL LIABILITIES, CLAIMS, DEMANDS, OR CAUSES OF ACTION WHATSOEVER FOR ANY HARM, LOSS, DAMAGE, PROPERTY DAMAGE, PERSONAL INJURIES OR DEATH ALLEGED TO BE CAUSED BY THE NEGLIGENCE OR GROSS NEGLIGENCE (but not intentional conduct) IN CONNECTION WITH OUR PRESENCE, PARTICIPATION IN THE ACTIVITIES AND/OR USE OF THE GYM’S FACILITIES OR EQUIPMENT. WE UNDERSTAND THAT BY SIGNING THIS AGREEMENT, IF WE OR ANYONE ELSE IS HURT OR PROPERTY IS DAMAGED, AMONG OTHER THINGS, WE SHALL HAVE (a) NO CLAIMS WHATSOEVER AGAINST, (b) NO RIGHT TO SUE, AND (c) NO RIGHT TO RECOVER ANY DAMAGES OR OTHER COMPENSATION FROM THE GYM. We give the GYM permission to use our likenesses (photo or video) for promotional purposes, without compensation. If any term or provision hereof is invalid, illegal or unenforceable, it shall be stricken only to the minimal extent necessary, and the remaining shall remain unimpaired. No provision can be waived or changed in any way (notwithstanding any purported oral statement or change on this Agreement) except expressly in writing personally signed by an owner of the GYM. All terms and paragraphs apply even if not initialed/checked. This Agreement is governed by the laws of the State of Arizona. This Agreement is irrevocable and has no expiration date. - Everyone is responsible for their own safety. - Don’t climb directly below or above other climbers; and watch out for falling climbers. - Stand clear of fall and swing zones; and stay clear of climbing areas when not climbing. - No climbing on top of the wall structures, except where and when permitted in the bouldering area. - Don’t touch the fire sprinkler covers. - Don’t grab, hang from or step on bolts or quick draws. - No wire brushes to clean holds. - No hip belays, munter hitches, swami belts etc..
- Right of way belongs to the first climber to start a route - others yield at a safe distance and do not begin climbing. - Parents must supervise their children. - No food or beverages allowed in climbing area- clear bottled water and “camelbacks with water” are OK.
- Place all personal belongings not in use in lockers or designated areas. GYM is not responsible for lost/stolen items. - Rappel only during designated times and while under supervision of AZR staff. - Helmets provided free upon request. 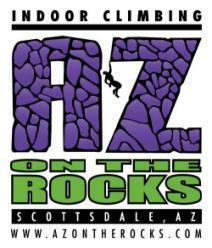 - If you have any questions or concerns, ask a staff member before climbing or belaying. - Use only UIAA approved harness and locking carabiner, and follow manufacturer’s guidelines. - Use only GriGri belay device, and know how to use it. - Tie in using a Figure 8 Follow Through Knot with back up. - Use floor anchors, anchored at the correct level, even if sitting down to belay. Do not belay lying down. - Before climbing check and recheck your and your partner’s harness, tie-in, anchor and carabiner. - Do not top rope on designated lead only routes. - Use the top rope that is closest to the final hold for the attempted route – avoid potential for wide swings. - Stay on the designated route(s) for auto belays - avoid potential for wide swings if you fall off of the wall. - No lead climbing without certification. - No one under 15 belays without completing Youth Certification course and test. - Auto belays: must clip in to harness before climbing; maximum weight is 330 lbs; re-clip to bolt on wall when done. - Use and properly position crash pads, but crash pads do not guarantee an injury-free fall. - Use a spotter, but spotters do not guarantee an injury-free fall. - No one under 15 without parent supervision. - Climbers may boulder outside of the bouldering area, but hands may not go above first quick draw. - Please do not set up or adjust the slackline, ask the staff for assistance. - No bouldering or climbing directly above the slackline. - No swinging from the rope hanging over the slackline. - No flips onto, off of or while on the slackline. I HAVE HAD FULL OPPORTUNITY TO READ AND HAVE READ THIS ENTIRE AGREEMENT AND RULES, UNDERSTAND THEM AND AGREE, JOINTLY AND SEVERALLY, ON BEHALF OF MYSELF AND MY MINOR CHILD(REN), IF ANY ARE LISTED AS PARTICIPANTS BELOW, TO BE BOUND BY THEIR TERMS. I REPRESENT AND AGREE THAT ANY MINOR CHILDREN I LIST AS PARTICIPANTS BELOW ARE, IN FACT, MY OWN MINOR CHILDREN OR CHILDREN OVER WHICH I HAVE BEEN APPOINTED AS LEGAL GUARDIAN BY A COURT AND, IF NOT, I AGREE TO DEFEND, INDEMNIFY AND HOLD HARMLESS THE GYM FROM ANY/ALL CLAIMS, LOSS, DAMAGE, ATTORNEYS’ FEES AND/OR COSTS RELATED TO SUCH MINOR CHILD’S PARTICIPATION. Please choose for ANYONE participating in ANY activity, including holding the ropes! Check to receive information, news, and discounts by e-mail. We will NEVER share your email address, unless required by law!